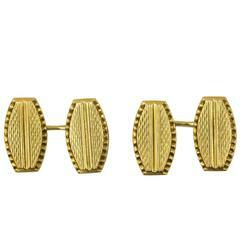 Circa 1910s set of cufflinks or cuff links with a set three shirt studs constructed from solid 14 Karat yellow gold. Each cufflink is set with a round polished mother of pearl. Along the mother of pearl is a rim of platinum. Total Weighs is 12.3 grams, marked 14K & PLAT on the cufflinks back. The links are marked Tiffany & Co. They come from the original box made from paper topped wooden box with Silk Satin and Velvet inside. The box is worn as shown on pictures. The large cufflinks measure 0.75 Inches height by 0.75 Inches diameter while the small shirt studs measure 1.25 Inches long by 0.50 Inches diameter for the disks. Tiffany & Company vintage sterling silver charm bracelet signed "Elsa Peretti." Five Charms. Simple classic cuff links marked "14K Tiffany & Co.". The squares at each end are hinged making them easy to use. Full length is 1-3/8" and they are 1/2" wide. Highly polished.